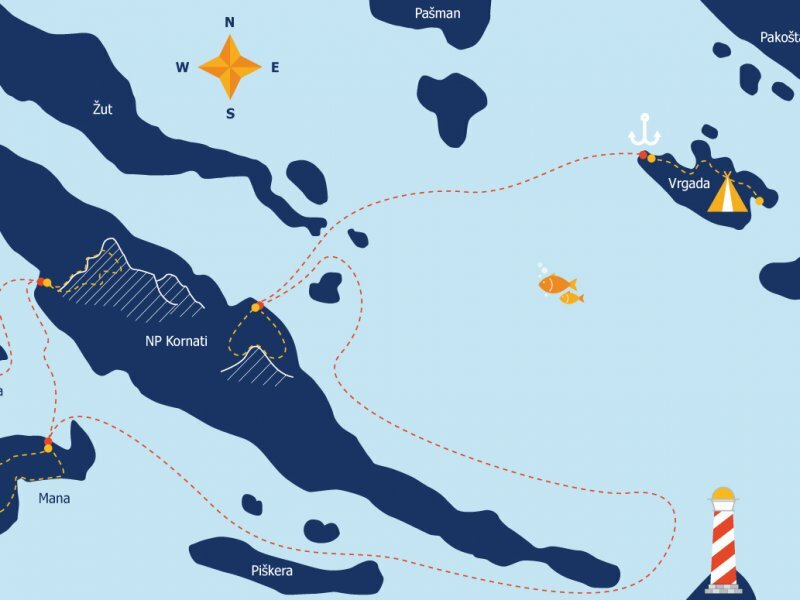 After delicious breakfast, we will start the day by taking a boat trip to Dugi Otok, an island a little ways from Pakoštane. 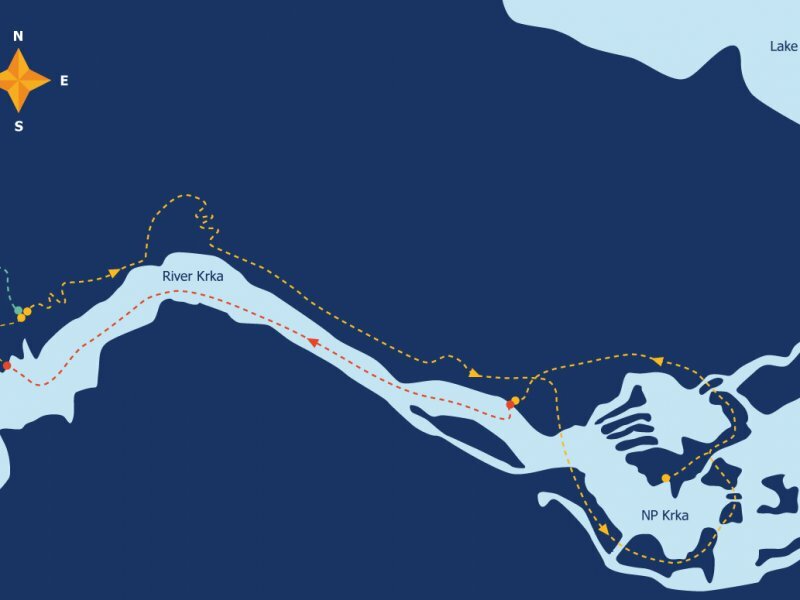 We will walk from the harbor town of Sali (more like a small fisherman's village) to the Telaščica Nature Park. You can take in the sight of beautiful olive groves surrounded by stone walls as we walk. At the Telaščica Nature Park, you will see a variety of coastal views and the many islands at the Kornati National Park. You can take a swim in the salt lake at Telaščica and admire the turquoise horizon from the top of 90-meter cliffs. 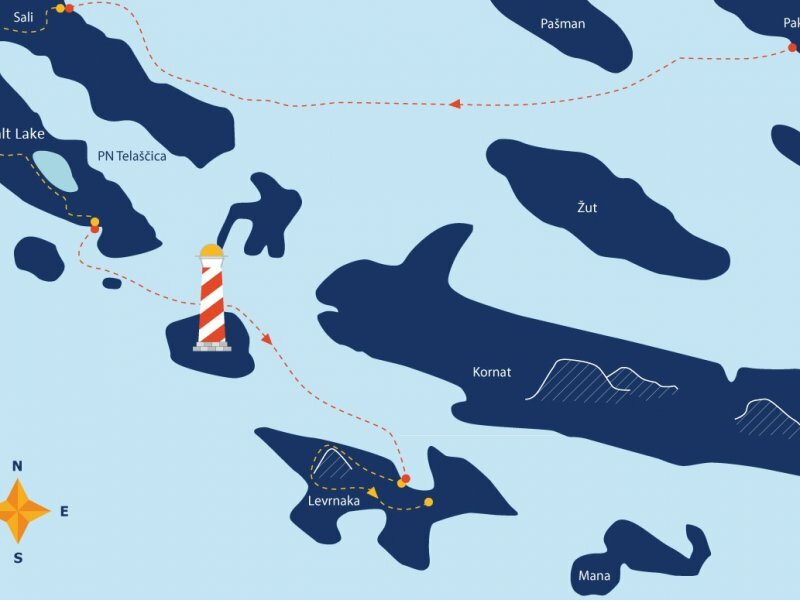 We will take the boat to one of the Kornati islands and spend the night there. 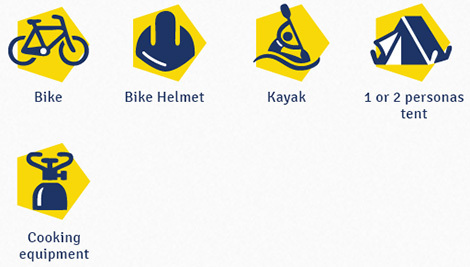 Throughout this day, you will have the opportunity to swim, hike and taste local food. 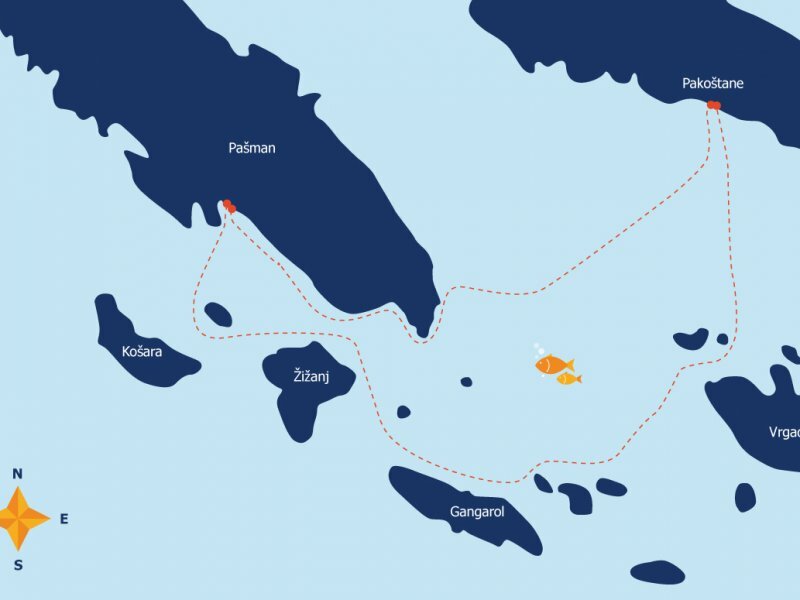 In the morning, the group will go to another of the Kornati islands. You will hike to the highest point in the park, where you can get stunning panoramic views of the entire national park as well as feel the morning stillness. Your guide will point out where you will be going throughout the day and week to come. In the afternoon, we will travel to another island and enjoy lunch at a local restaurant in the bay of Kornat. At sunset, we will travel to the island of Vrgada and breathe in the clean, pastoral air. There are no cars on this island; only people. We will camp out under the stars. We will return to Pakoštane in the morning and begin our bike tour from the village to Vrana Nature Park. 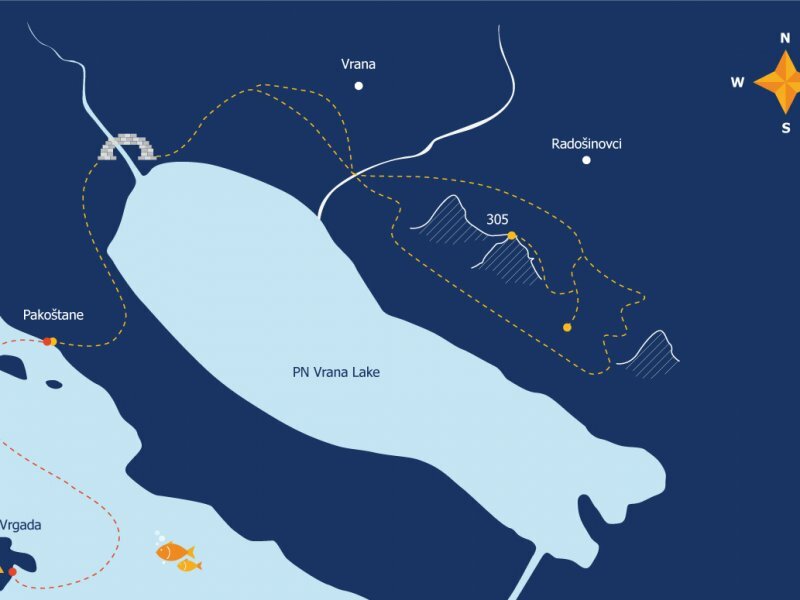 We will notice the complete change in the landscape as we approach the largest lake in Croatia, Lake Vrana. The tour will pass through the village of Vrana alongside the park and take a short break to see the Turski han, an Islamic monument dating from 1644. We will bike up to Kamenjak Hill, (photo/view point) and look out at the islands we've visited. At the foot of the hill the road changes from asphalt to gravel as it leads us right to the heart of Vrana Nature Park. We will spend the rest of the day exploring the park. The group will sleep at lodgings in Pakoštane for the reminder of the trip (We will sleep for four nights in Pakostane). The fifth day of the tour, we'll drive to the southern part of Velebit to see the Paklenica Nature Park. Considered a paradise for climbers and hikers, we'll explore the most stunning parts of Paklenica. We'll take a path that leads us to the Manita peć cave and over the mountains, so hikers and trekkers can get the best experience out of the varied and diverse terrain. The trail will loop around, and by the end of the day we'll be right back where we started. We return to the sea on Day 6 to spend it sea kayaking around the bays surrounding Pašman Island. The group will spend the morning kayaking around the southern and eastern parts of the island, then park boats and enjoy lunch and a nice siesta on Pašman itself. Pašman Island is home to Robinson-stone houses, built to go on holiday away from the bustle of the mainland. Pašman Island is connected with a "twin brother" island by bridge, and ferries run year-round so that life can continue on the islands during winter time. 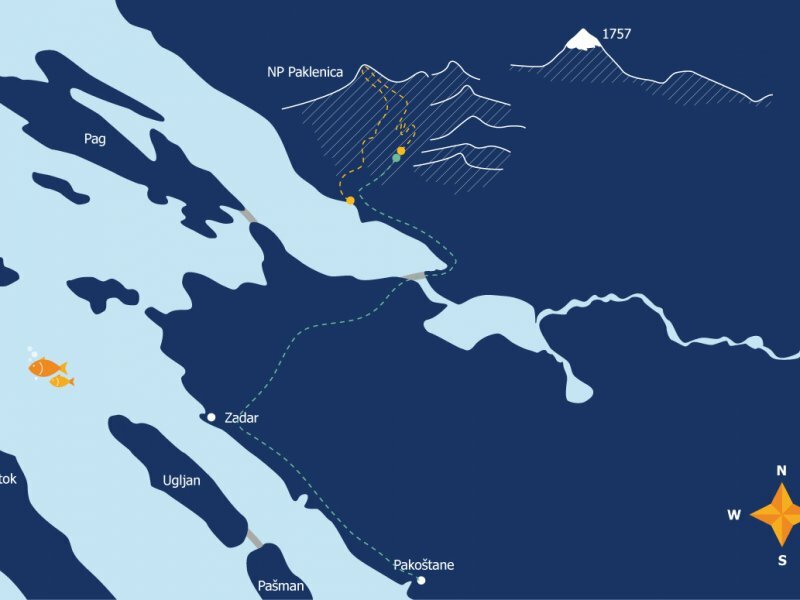 We will return from our day at sea before sunset and spend the night in Pakoštane. Our final day will begin at magical Skradin, located where the Krka River embraces the sea. We will begin the day's hike from here. The hike will go up a ways, follow the edge of a canyon, then descend along the edge of the Krka River. In late morning to early afternoon, you will have some free time to visit the stunning waterfalls at the Krka Waterfalls National Park. We will ride back to Skradin by boat, enjoy a little coffee break and walk through the old town in the afternoon. The group will arrive back at Pakoštane in the late afternoon, and you can explore for a little while. As you enjoy your final evening in the city, be sure to try the best pancakes in Dalmatia.